Which is both very true and very not helpful! Allow me to elaborate. I’ve started kids with great success as young as age three and I’ve started kids with not so great success at 9…and 12…and 50! Alright, maybe the 50-year old doesn’t count as a “kid” anymore. 🙂 My point is, there is no magical age at which a student is “ready” for lessons. That said, have observed a few characteristics to help you evaluate when you might give lessons a shot. Has your child expressed an interest in the piano? Do they systematically plunk around and explore the piano at home? If they’re still banging the keys with toy trucks, you can hold off, but if they constantly summon you to hear their latest compositions, they’re probably ready to dig deeper. Does your child enjoy focusing on a single activity (like reading a book, playing with LEGOs, or doing a puzzle) for 15-30 minutes at a time? If they struggle to stay still and attentive, piano lessons may prove to be a futile battle right now. Work on activities to practice attentiveness at home for a few months and then re-evaluate. With honed focus, that energetic personality will bring zest to their piano playing! 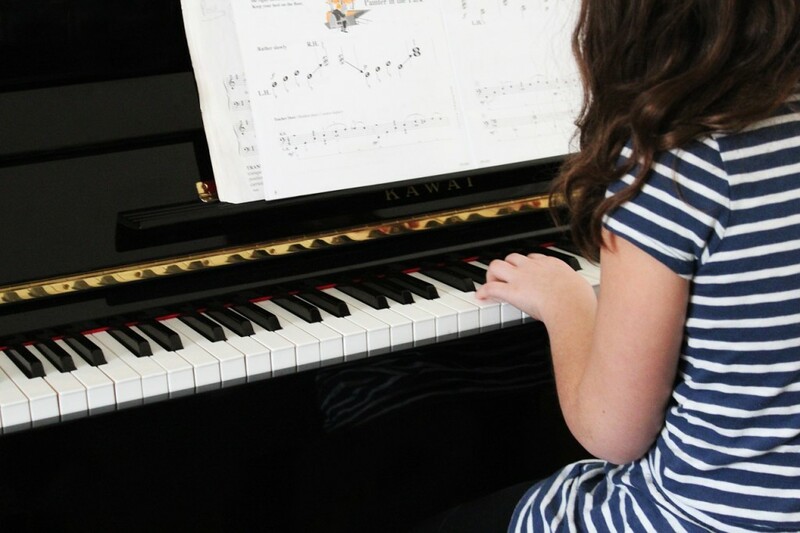 If your child has a schedule so packed with activities that he barely has time for homework and sleep, let alone practicing, it’s not the right time to add piano lessons to the mix. Music lessons do require a significant time commitment and students who don’t put forth the effort, for whatever reason, quickly become so frustrated by the lack of progress that they begin to dread everything about their instrument. No respectable teacher wants that for their students! Wait until you can make lessons and practice a priority so he has the best chance at an enjoyable and successful experience! Ultimately, you just have to sign up for lessons and see how it goes! I encourage parents to find a teacher who is compatible with their child and commit to at least 2-3 months of lessons before making a final decision. At first, everything is so new – new environment, new teacher, new subject – and it’s a lot for a young student to take in. Most young beginners are distracted or shy for a few weeks until they get used to the routine so you need to allow time for the newness to wear off before you decide whether or not lessons are good for your child at this time. (Just because it’s not working now doesn’t mean it won’t work out in the future!) After two months it will probably be pretty clear whether or not you should continue. There is no “magic age.” Although the child may be “ready” to start lessons, there’s no reason to rush into formal study if it will do more harm than good. My goal is for students to both learn from and enjoy their piano lessons. I would much rather a student wait until age 10 or 12 and enjoy lessons, than force it on them at age 4 and have them turned off forever! Are you a teacher with additional thoughts or insights on this subject? Any parents out there who want to share how they made the decision to start (or wait for) piano lessons? I’d love to hear your experiences! We piano teachers are a lovely, caring, encouraging group. However, some of our job involves correcting and teaching new things. If your child is resistant to criticism or resists learning new things, it may be better to wait to begin lessons. Great point! Thanks for chiming in!